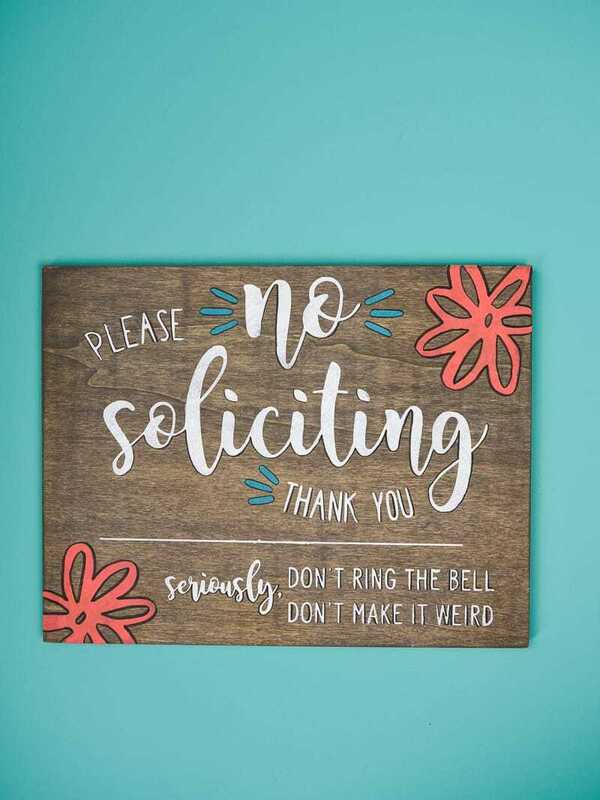 This No Soliciting Sign can be made in five quick and easy steps! It’s been a year since we moved into our house (what?!) and in the past few months the solicitors have been out of control. About three times a week we have someone knocking on the door during naptime or dinner to ask us about home improvement, who we’re voting for, and if we need Jesus. First of all…my bank account is still trying to recoup from buying a house. Second, I know who I’m voting for and (no) you will not change my mind, AND third…Jesus and I are friends. I’m good on all three accounts. Even still, I feel bad that these people have to go door to door and try to sell people on stuff. But it’s ridiculous to have to answer the door multiple times a week for it. So I turned to my Silhouette for help and designed my own no soliciting sign for the front door. Sure, I could’ve bought one from Hobby Lobby but where’s the fun in that? I’m actually curious to see if hanging the no soliciting sign will work. Or if they’ll ignore the sign altogether and just knock anyway (the latter is what I’m expecting to happen). But I’m going to try anyway and hope for the best! Typically when I make wooden signs I seal the stencil with mod podge before painting it. I still get a little bit of paint bleeding through (which is a tad annoying) but it never looks too terrible where I am completely disappointed in the finished look. But I was on a Facebook thread the other day where someone suggested sealing it first with spray sealant and then painting. So I tried it for this project and I don’t think I’ll ever go back to mod podge again! It was a little more time consuming because I waited an hour for it to dry but the results are 100% worth it and all my signs from here on out will look better because of it. 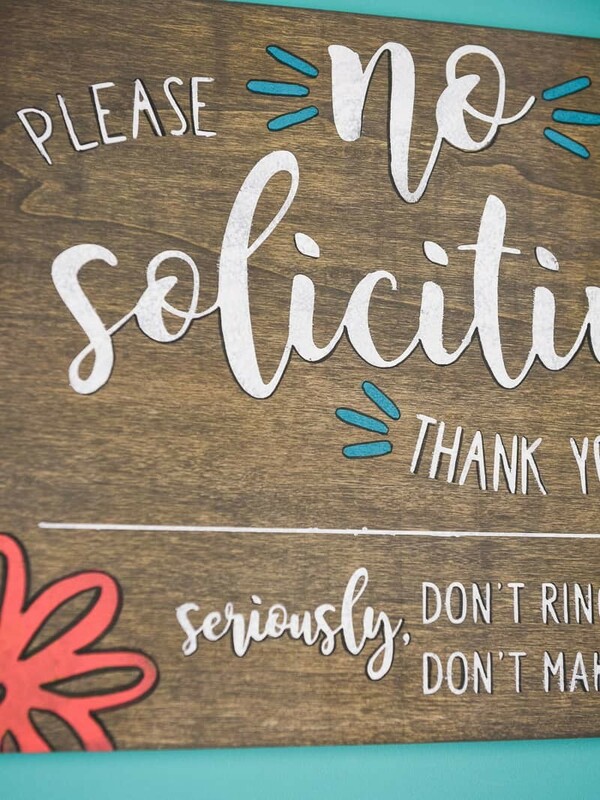 So yep, I am a sealant convert and will tell you to go buy that little spray can from Hobby Lobby (or Lowes, or Home Depot) because it’ll be your new best friend if you make loads of wooden signs. A quick word of warning though….always spray outside. That stuff smells and you need to do it in a well-ventilated area. 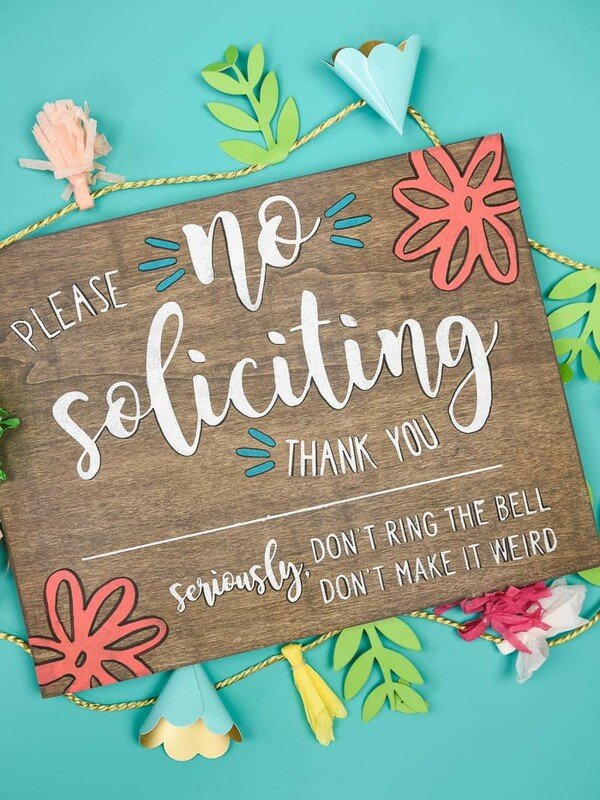 How to make your own no soliciting sign in 5 easy steps! 1. Stain or paint your wood and set it to the side while it dries. 2. Cut out your stencil and weed it. Put transfer tape on top of it and pull it off the backing. Place it on your piece of wood. 3. Place the stencil on your wood and peel the transfer tape off. Then spray the sealant (one light layer) on top of the stencil and let it dry. 4. Paint your design. I love using these brushes when painting on wood! 5. Spray another 2-3 layers of sealant on your piece of wood once the paint is dry. If you’re going to hang it outside you could do a few more layers as well! Read the back of the can to see what it recommends. If your wood doesn’t have twine on the back to hang it from, add it now. Hobby Lobby does have signs with the twine though so save yourself some trouble and get a piece of unfinished wood with the twine already connected! I’m not sure how long the sign needs to cure after being sprayed, especially since it’s going outside. So I’m going to let it sit for a few days until I hang it out there. I figure it’s better to give it extra time than not enough! Just a few quick things that I learned while making this sign that you need to know! + According to fellow crafters in my favorite Facebook group, the dry hinge method is perfect for getting your vinyl perfectly lined up on all your projects. It takes a little bit of time to set up initially but it’s so worth it in the end! + This may be a “duh” moment for most but do not breathe in the sealant when you spray it! I didn’t check which way the wind was blowing when I was spraying the sign and I didn’t realize I was right in the line of fire. I got a killer headache as payback…so always check the wind when you’re spraying! + If you want to make your design POP, outline it! I used a calligraphy pen and just went around the letters and the flowers. It gave the whole sign and completely different look and I am obsessed with the outcome! The most difficult part of any wood project for me is the paint bleeding through the stencil. It’s usually so bad and drives me absolutely insane. There was still a little bit of bleeding with this sign but it was 1000 times better after using the sealant. I’ll never make a wood sign without it again! Want more wooden sign inspiration? Check these out! more crafts with stencil vinyl! I love how this turned out!! It’s so cute and cheery! Perfect for telling people not to ring your bell haha!